As I’ve delve into the wonderful world of film making I am finding new experiences and new things to learn around almost every corner. Having only a zero budget film(Love(less)) under my belt and 1 or 2 others in development, I’ve been curious to get on a set of a big budget feature film. 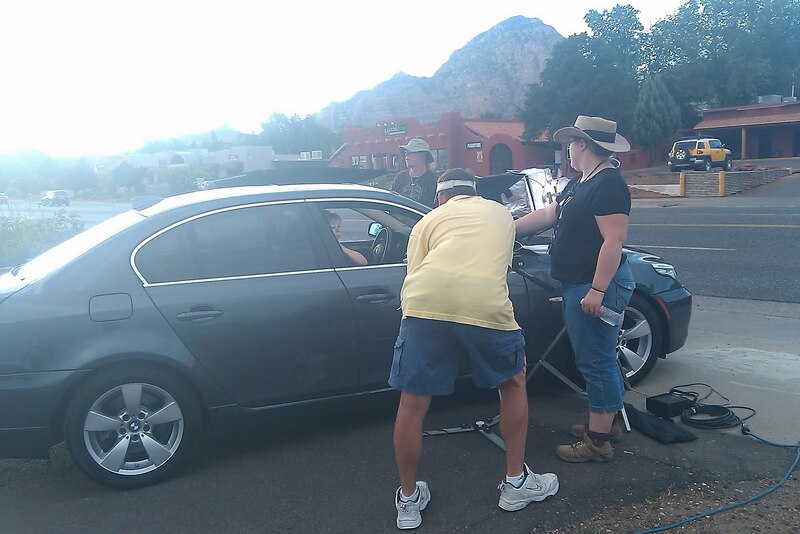 I had that opportunity in late July for 2 days as I was invited on the set of “Sedona.. The Motion Picture” starring Frances Fisher, Christopher Atkins, Beth Grant, Barry Corbin & Seth Peterson.Just because these people are cast in the film does not mean they are always on set at the same time. During a 5 or 6 week shoot some actors may appear for a day or 2 depending upon the length of their scenes and schedule. Having met Tracey, one of the producers, we planned on me shadowing producer/1st asst. director Jeremy. Most people think movie sets are like what they may see on “Entourage” big spread of food, trailers of actors and actress’s,etc.,etc. What really happens on a set is nothing less than controlled chaos. 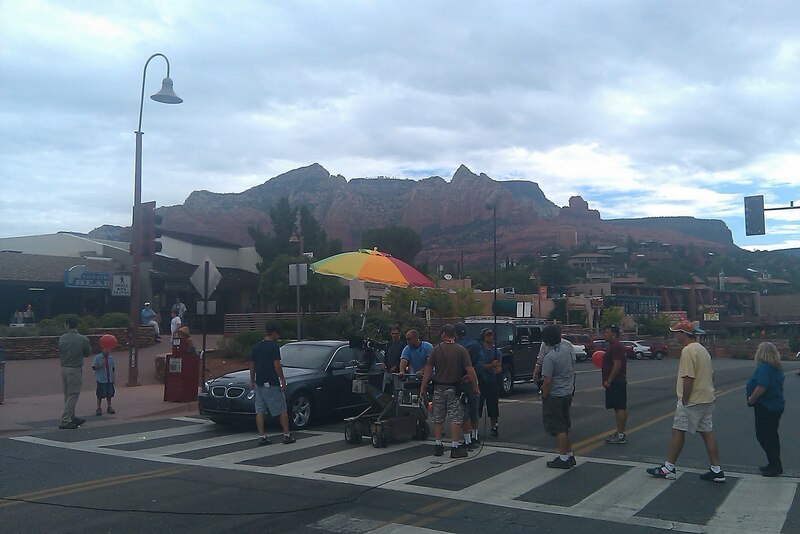 Especially when you are dealing with a public street that has everyday traffic moving through, pedestrians and tourists looking on in uptown Sedona. If you’re lucky you can have the street closed during off hours.If it’s a private setting you may have to deal with un-cooperative weather, talent that may want to have it done there way, etc.,etc. Not that you can’t have these same difficulties in a more public setting as well. What I saw was a very talented cast and crew dealing with those issues and then some. Like waiting for the clouds to provide shade for a scene, setting up different scenes w/ the camera, actors rehearsing and several different takes until the director see’s what he likes. Many people running around contributing to their given responsibilities and in an effort to make each days scenes be filmed just right. Most days on set can be 12-14 hour days. It was just a peek of what’s to come in my aspiring movie career. Thanks to Tracey and cast and crew for allowing me to join them for a couple of days. In a town that’s is full of sushi bars, pizzerias, burger joints and Mexican food it’s refreshing to find some uniqueness every now and then. And when I say unique I don’t mean expensive, chef driven uber cuisine. In this case I’m thinking of something that dates back to 1200s and from southwest England, Cornwall to be exact. I’m thinking of Cornish Pasty Co. w/ locations in Tempe and Mesa. Pastys are dough that is stuffed with meats, cheese & vegetables that are then folded and crimped closed and baked. Think English version of a calzone, but not as big. They were made by the wives, mothers and daughters of men sent into the tin mines of SW England. They are made with traditional ingredients of steak, potato, onions and rutabaga(Swede). At Cornish Pasty they make The Oggie($6.50) which is the traditional kind and 36 other signature,premium and vegetarian pastys. No pasty is more than $9.00 there are some unique fillings including The Lamb Vindaloo if you’re looking for a curry and spicy taste or how about one of the newer pastys The Royale with Cheese($7.50). Hamburger meat w/ French fries, grilled onions, mushrooms, bacon and a cheddar Swiss blend. Being that we are a lot closer to Mexico than England There is also The Mexican($8.00) & Carne Adovada($8.50). Can’t find a good Reuben in Mesa, there is one menu sans the rye bread for $8.00. For those that are watching their carb intake Cornish Pasty has 6 salads to choose from all at or under $8 unless you add chicken, lamb or salmon. 4 soups made from scratch are available served with homemade bread & butter. They also have 12 sides including Mushy peas($2.25), British style oven chips($2.25) potato chips baked and seasoned with cracked pepper and sea salt are just to name a couple. If you have a sweet tooth and can find some room there are 6 desserts available. Banoffee Pie($5.00) sounds delicious w/ its graham cracker crust,caramel, whipped cream and banana. As does Shirley Temples Pudding($6.00) which is a sticky toffee pudding w/ cream anglaise. Yum!! Several wine and beers are available and are featured as daily specials. We enjoyed our Mickey’s malt liquor for $1 or $2. So if you’re cruising University Dr. in Tempe and want something different or in the Dobson & Guadalupe area in Mesa stop in for pasty. You’ll be glad you did as I was and will continue to be. www.cornishpastyco.com Tempe location is at 960 W. University(NE of University & Hardy)480-894-6261 and in Mesa at 1941 W. Guadalupe (SE corner of Dobson & Guadalupe)480-838-3586. Posted on August 10, 2010 Categories cornish, dobson, pasty, universityLeave a comment on Cornish Pasty Co. I wasn’t sure what to think before seeing “The Other Guys” the other night, but the pairing of Mark Wahlberg & Will Ferrell had me wondering how an action/ drama guy like Wahlberg would play with Ferrells kind of humor. It turns out they make quite the pairing. In this cops and robbers film where Gamble(Ferrell), a forensic accountant turned cop who does’nt want to leave his desk and computer gets paired with street smart, gun toting Hoitz(Wahlberg) who gets desk duty for an accidental shooting. As Hoitz gets his itch to get back on the street, 2 hot shot cops(Samuel L. Jackson & Dwayne Johnson) meet an untimely death. With there opening to get back on the street and some persuading by Hoitz they decide to track some Wall St. fraud. Not to mention 2 other very competitve cops who are always trying to beat them to the punch. The two opposites decide to bond over dinner at Gambles house and meet his wife Dr. Sheila Gamble(Eve Mendes). Throughout the movie Hoitz is always wondering how Gamble married such a beautiful woman and has been able to attract other beautiful women since college. That pulls back another layer as Hoitzs alter ego from his college days makes a re-appearance and helps in the partner bonding. Throw in some Chechen rebels and angry Nigerian investors you’ve got a film that’s more than the expected comedy. Some typical Ferrell humor comes into play but Wahlberg shows his humorous side by bouncing back the humor. Bring in Michael Keaton as their Captain at work, who moonlights at Bed, Bath & Beyond and you’ve got a pretty funny movie with a timely story line. Some good chase scenes turns this comedy into a bit of an action film as the guys run the streets of NYC. In the end you should be happy you saw this film as I was as it hits most cylinders. I recommend staying through the credits as there are rolling statistics from the economy’s meltdown of the last few years are shown. There is also a blooper from the film at the very end of credits worth watching. 4 corks out of 5.